Those really are just stereotypes, and your experience does not have to be like that. While predatory movers exist, most reputable companies do a terrific job helping customers move massive amounts of heavy and precious things across the region or the country, and they do it for a reasonable price. Your agent has experience in recommending movers, so trust in a referral to someone who has a sound track record. Don’t wait until the last minute to start hiring a mover, or you’ll end up not being able to get scheduled in time, you might have to pay more, and you’ll be doing everything in a rush. You can start planning your move as soon as you are in con tract , or at the very latest as soon as you are clear to close with your lender. You basically have two options about the type of move you want. 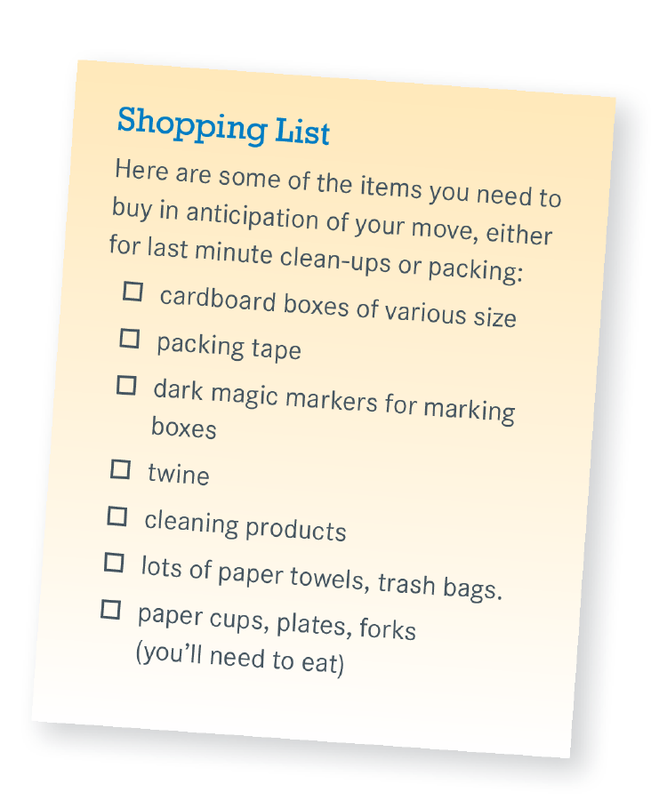 In the standard option, you need to pack all the small items into boxes, seal them up, label them, and then have them ready for the movers. You don’t need to box big items, or carry the big items anywhere, but you need to pack up things like clothes, books, dishes, cookware, silverware, files, knick-knacks, things like that. That can be an onerous job. The other option is to pay extra for the movers to do all that for you. People who have experienced that full service option will never go back to packing themselves, because it is a glorious feeling to watch the movers descend upon your home and quickly pack, seal, and label all your things. It’s an easier way to move, but also a better one, because the movers are much, much better at safely and quickly packing your things than you are. Trust us, it’s worth the money. One of the reasons to get started early is so that you have time to interview up to three reputable movers to get estimates. Let the movers examine your things, get a full sense of the scale of the move, and give you an estimate. You can learn a lot about the movers just from the way they interact with you, and get a chance to choose a mover based on your gut feeling on who you would like the most. That said, if you get a referral from your agent for one mover, and you like that mover, you shouldn’t feel the need to go interview two more just to feel like you’ve done your due diligence. The mover’s estimation process should include a physical survey of all the things that you need to move, rather than simply an over-the-phone or internet questionnaire. Professional movers have a good eye for the requirements of a move, and most of us do not. They will pick up on things that you won’t. In our experience, many problems between movers and customers stem from a customer’s unreasonably low estimation of the amount of work that needs to be done, leading to an inaccurate estimate. Never hire movers that refuse to do an in-house survey and instead assure you that they can give an accurate estimate over the phone or internet. When you move, you have the right to get moving insurance. Insurance comes in three levels of protection: “Full Replacement,” which costs the most and guarantees the full repair or replacement of any goods lost or broken; Assessed Value Coverage, which is based on the estimated cost of replacing the assessed value of goods lost or stolen; and “Alternative Level of Liability,” which only pays out liability at a standard rate of 60 cents per pound. You will find that in most cases it is worth getting “Full Replacement” insurance, but it really depends on the content, distance, and comfort level associated with your move. Don’t pay to move things that you’re never going to need or use again. Moving is a great opportunity to pare down your life, eliminating items that you’ve been storing for years. Go over those items carefully. A lot of times, you boxed them up in your last move years ago “just in case” you needed them. The rule of thumb is that if they have spent more than four or five years boxed up without being needed, you’re not going to need them in your new place, either. So donate them, hold a garage sale, or throw them away. On your moving day, be engaged with the movers. Moving day can be difficult and stressful, but you will have a better experience if you fully engage with the movers and stay on top of everything. Be home when the movers arrive with everything you need to do already done, so you can focus on discussing delivery arrangements. 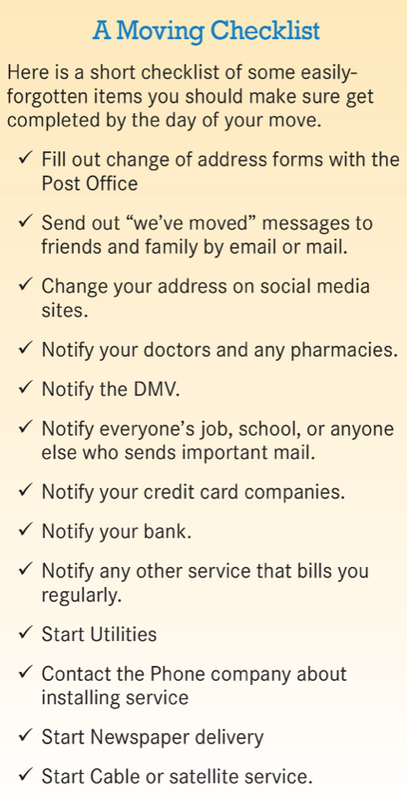 When the moving out is complete, and you are ready for transport, make sure the movers have a phone number to reach you, and that you have their number in case you want to contact them. Even with the best movers, and the best intentions, delays can happen. That’s why you need to make sure that you separately pack your personal items: changes of clothes, medications, toiletries, etc. The easy way to do this is just to imagine that you’re going on a three-day vacation or business trip, and pack a suitcase with everything you’ll need in those three days just in case the movers have difficulty getting to your new home. Even if the move can be completed in one day, and you’re not worried about that, having your “three-day vacation” suitcase separately packed allows you to unpack the rest of your stuff without the pressure of, say, trying to find the box that has your hair dryer. Let the movers do the work, you supervise. Make sure they get everything off the truck, and let them do the unpacking of the boxes while you tell them where everything should go. Many people seem to feel guilty of making these poor movers carry all that heavy stuff, and they want to pitch in. Don’t pitch in. That’s not your job, that’s their job, and they’re getting paid for it. What you need to do is your job: supervise to make sure everything comes off the truck and the boxes are put in the correct rooms. This is not required, but it’s always a good idea to have bottled water and coffee available for the movers when they arrive, and to offer to pick up pizza or a quick lunch while they’re working. It’s better for you to run out and buy them lunch than for them to take an hour off in the middle of the day. And providing water and coffee is just humane for people who will spend hours lugging your things around. If you get good service, and want to tip the crew, the best guideline we can give you is about $10-$25 per person who was part of the crew for the whole day. As with all services like this, tips are not required but appreciated. Finally, one last piece of advice about moving: don’t move on the day that you close on the sale. A closing can be stressful event that doesn’t happen very often, and moving is a stressful event that doesn’t happen very often. There’s no reason to do them both on the same day. You should plan for your move no earlier than a day or so after the closing, so you can get one big stressful day behind you before you turn to the next one. At Better Homes and Gardens Rand Realty, we believe that our obligation to our clients extends beyond the closing. As part of our Client-Oriented Real Estate (CORE) program, we follow the philosophy that our clients need real estate related services even when they’re not buying or selling real estate. After all, your accountant is still your accountant, even though you probably only work with him or her once a year when you do your taxes. In that same way, we believe that our agents should continue to work with you, and our company should continue to provide you with services, even after your closing. Now, you might be thinking, “what do I need a real estate agent for if I’m not buying or selling real estate?” Well, think of it this way – who would you call if you were in any of these situations? •You need a recommendation for a good landscaper. •You want to know whether adding a pool would raise or lower your property values. •You need a market valuation for a tax grievance petition, or for your home insurance. •You are thinking of renovating your kitchen, and wonder how much it will impact your home’s value. •You’re wondering what that home down the block just sold for. In all these situations, you really just need a good real estate agent. An agent can give you recommendations for various home service professionals (and probably some good restaurants, dry cleaners, and the like as well), can advise you about renovations or home improvements and how they’ll impact your property values, can get you all the information you need about the market, and can even do a comparative market evaluation any time you need it. The same holds true for our Hudson United home services companies for mortgage, insurance, or title. If you ever have questions about your mortgage, insurance, or property title, you should feel free to reach out to us. For example, if you’re concerned that someone might have put a lien on your property without your permission, you should absolutely get in touch with us so we can provide you with a complimentary lien search to check the status of your title. But we’re not just going to wait until you reach out to us with something that you need. Rather, at Better Homes and Gardens Rand Realty, we’ve created a series of programs to deliver services to you on an ongoing basis. For example, you’ve already seen that we’ve provided you with information about having a great move and grieving your property taxes. We feel it’s our job to help you with anything that relates to real estate, anytime you need us, regardless of whether these matters come up following the closing of your home. The Rand Quarterly Market Reports. The same quarterly market reports you’ve probably been reading during the course of your home search will be delivered to you either through the mail or via email. This is a great way to keep track with what’s going on in the real estate market. After all, your home is probably one of the biggest investments you have, so you should be watchful as to what’s happening with local market values. The Rand Seasonal Event Guides. Along with the market reports, Better Homes and Gardens Rand Realty provides four seasonal guides to community events throughout the region – everything from parades to street fairs and exhibitions. It’s a great way to get to know the region and to take advantage of all the wonderful things to do in the area. Better Homes and Gardens Magazine. When you buy your home through us, you’ll be getting a complimentary yearlong subscription to Better Homes and Gardens Magazine, one of the most popular magazines in the country and the iconic source for information about everything having to do with maintaining and improving your home and life. Why do we do all this? That’s a good question. Most agents don’t even consider providing these non-transactional services for a very simple reason: they don’t get paid for it. But we believe that we owe our clients a higher duty than just guiding them through a home purchase or sale. Moreover, we are thinking of the long­ term, and the hope that you will someday need our services to sell that home that we just helped you buy. And in the meantime, we truly hope that you will recommend Better Homes and Gardens Rand Realty and your agent to anyone you know who might need real estate services. We believe we’re the only company in the country prioritizing the delivery of great service to clients, even non-transactional clients, as a foundation of our business. That’s what our CORE client care program is all about, and what this Orientation Guide has been about. We hope you’ve see the difference in the experience that you’ve had with us, and in the experience that you’ll continue to have with us. From everyone at Better Homes and Gardens Rand Realty and the Hudson United companies, we wish you the best of luck in your new home.